One would imagine finding a location as exquisite as the Cliffs of Moher Retreat, would have involved months of hunting, bidding and stress. However as proprietor, Michelle Moroney believes, when you are doing something positive and that is destined for you, things just have a way of working out. Located next to a UNESCO site, there is an expanse of scenery. 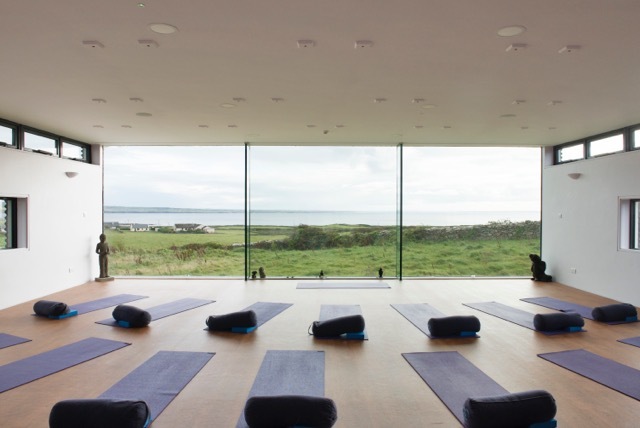 The yoga studio itself looks out over infinite views of the Atlantic Ocean and the sense of space is vast in contrast to the warm embrace of community. According to Michelle Moroney, who owns the retreat with her husband, Michael, how they came upon the retreat was one of those things that was; “just meant to happen”. Michelle started on her path to wellness when she moved to Hong Kong in her 20s. Having come from Ireland she had taken clean air for granted. The heavy pollution in the city made her very conscious of having no control over what went into her body and she decided to start actively making decisions over what she could. She used her five years there working as an English teacher to travel across South East Asia and develop her passion for yoga and scuba diving. It was during her time spent diving in Thailand that she came across The Orion Healing Centre in Koh Phagnan, featured in the Netflix documentary “The Retreat”. She spent 6 months working there and says that it solidified her interest in feeling good and being healthy. Her “light-bulb” moment, as she describes it, came as she was teaching yoga on top of a rooftop by candlelight in Sinai, Egypt. An American student told her that it was the most perfect holiday, scuba-diving by day and yoga by night. “ A light went off in my head and I came up with the idea of Yoga Traveller”. It was around this time that husband Michael came on the scene. They organized yoga holidays with activities in locations all over the world including Bali, Mexico, Thailand and Italy among others. When Michellle became pregnant, the couple decided that they would move back to Ireland and base themselves in Dublin, the nature of their work allowing them to do so. Michael’s father came from a little town on the West Coast of Ireland called Miltown Malbay. Michael had spent his summers there and had a huge affinity to the place. It was where he had his first kiss and his first drink. Upon visiting the place, Michelle had little reluctance when he suggested a move to there. “There is such a broad perspective of health down here. It’s not niche. There are yogis that have never seen a yoga mat living around here. It’s very much about community and open mindedness and expression and walks on the beach, which is yoga and meditation”. The path to opening their current 14- bedroom retreat revealed itself from that point on, in a serendipitous way. The location was rented and unfortunately, was being put into receivership by the bank. One day in 2012, an auctioneer came to see the property. Seeing the yoga mats lying around he put two and two together and told Michelle and Michael about a property that he had just put on the market that very day. In fact the entire 10 acres of land and five houses attached to it, went for the price of one house. According to Michelle it is more than just yoga at a retreat. They view all aspects of the retreat as being as important as each other, whether that is the welcome, the food or the environment. Food is something that the retreat takes very serious and something that Michelle believes can have a significant effect on how you are feeling mentally. Having suffered a period of depression in her 20s, Michelle says that she can feel the difference in her mind depending on the choices she makes in terms of her food, her exercise and the amount of time spent outdoors. She hopes that her retreats encourage people more in this direction and plans to launch a new program that will involve three months of coaching after you leave the retreat also. Classes taught are retreat style and two hours long. This allows for a nice warm-up period and extended relaxation. The more dynamic practice is in the morning and yin and restorative yoga in the evening. Days are spent on guided walks of the cliffs of moher and in meditation. Retreats range from 2 nights to 7 nights, with clients attending from all over the world. There are also retreats that involve cookery classes.